When you’re traveling with kids, simplicity, ease, and any tricks that can save time are everything. If you’re planning a family trip, you might be looking for some travel hacks to make the packing process, the flight or road trip, and the hotel stay less stressful. I surveyed some seriously experienced parents who travel with kids often, and asked them for their best travel hacks for families with young children. Our family has been doing a lot of travel with our three kids, and there’s not teacher like experience. Each trip we get a little more efficient, and the kids do better and better on the road or in the air. However, sometimes it helps to turn to parents who have been there, done that to help shorten the learning curve and make your life a little easier as you plan your next vacation. Make a list of everything you need to take including children's favourite toy/blanket etc then tick the items off as you pack them, take the list with you to ensure everything ends up back at home after the holiday! With seven children we have been using this system for years, each year we update with new items or take off ones no longer required. Always pack a baby wrap. It has a multitude of uses apart from its use as a baby carrier from sunshade to hammock, blanket to comforter. It also makes it easier to navigate cobblestone roads and crowds with bub in your arms rather. Use packing cubes! These mesh bags come in a variety of sizes and colors. Each member of our family has their own unique color, which helps keep things straight. The best part is, I can start packing these cubes before the bulky suitcase even comes out of the closet! I know some people use giant ziplock bags, but I prefer these because they’re far more durable and reusable. More importantly, once we’re in the hotel I just unzip the top open and they go straight into the drawer as is. You can buy packing cubes online or in any good travel store. BONUS TIP: Designate a packing cube for emergency clothes that you keep in your carry-on luggage. My favorite packing travel hack (besides packing cubes! Those things are amazing!) is to pack clothes in one color scheme (for example: blue, yellow, khaki) for everyone so that you can mix and match clothes (and therefore pack less) and you’ll all look coordinated in your vacation pictures, too! Consider bringing a small amount of laundry detergent so you can wash clothes in the sink or bathtub then rewear them! What travel hack is a blanket, a fort, an eye cover, a privacy barrier, a picnic cloth, and a towel? A sarong wrap! Essential for family travel around the world. We bought a portable travel bed for our baby last year at the beginning of our 3 months long Europe trip. We didn't have to worry about accommodation arrangements for the little one. Always travel with the second or third favorite snuggly -- not the all-time favorite. If it gets lost or left behind, #2 or #3 are replaceable with something new and cute. Losing #1 is pretty miserable. We started this very young and my daughter accepted that #1 doesn't travel. Some people, myself included, experience intense inner ear pain during takeoff and landing due to the cabin pressure change. My trick is to wear earplugs and chew gum, especially during landing. However, I wouldn’t recommend that for young children who may pull the plugs out or swallow the gum. If they’re no longer nursing or using a paci, try giving them a lollipop. (I buy organic ones from the health food store so I don’t feel super guilty for plying my kids with candy). The act of sucking should help their ears adjust easier to the pressure change. Also, they may be so happy to have a lolly they won’t even notice any discomfort. Put a different sticker on the front of each passport. It makes it WAY easier to find the right one at airports, customs, etc. Did you know you can reserve a bassinet for your child on international flights? I didn’t either. It’s not available on every plane and you have to reserve it along with bulkhead seats, many months in advance, BUT if you want to be extra comfortable during long-haul flights, you can reserve a bassinet at no cost- just call the airlines after booking your seats to make sure they have one available on the plane for you. There are only a few bassinets available on every flight, so it’s on a first come, first served basis, but a wonderful perk that I had no idea existed. We buy a new package of stickers every trip and a fun spiral notebook with empty pages. You will find that sticking instead of drawing is sometimes easier when small hands tire because of developing fine motor skills. Washi tape or post-it notes work great here too. Have your kids carry their own small backpacks with entertainment for the flight. We put Crayola Color Wonder markers and coloring books, their Kindles, snacks, and one or two toys in theirs. It really helped to have them be in charge of their own entertainment when I was flying solo with three kids! If you’re flying to a destination where you’ll be renting a car, bring a travel-worthy car seat and use it on the plane! Your kid will be safe in the air and on the ground, and a lightweight, inexpensive seat will make the process so much easier for you. Call your airline before your flight to make them aware of your food allergy. They will usually make a special note for the flight so that you are able to pre-board and will often times notify the flight staff so they can possibly make a special announcement on board the aircraft for you. Some airlines will even go as far as to not serve any nut or peanut products on a flight when they know they have a nut allergic passenger. When you arrive at your gate be sure to remind the gate agents about your allergy and when you board the plane you can politely remind the flight attendants as well. We keep a little stack of plastic drawers at the end of the trunk with a set of clean clothes for each kid, extra diapers, medicine, wipes, rain gear, etc in it just in case we have a sudden accident and don't want to unpack the trunk to find an essential. On family road trips, I often bring along a bag of surprises (items I purchase ahead of time from clearance racks or a dollar store). When the children become restless or bored, I pull out an unexpected surprise like a new activity book, an action figure, kaleidoscope, etc. And, the children are happily occupied again for a while. Dryer sheets will help keep your car smelling fresh no matter what happens on your drive. Plus, they’re easier to pack than other deodorizing options. Put old sheets over the seats of your car to catch crumbs and prevent spills from ruining your car. Freeze a gallon of water and put it in your cooler as an ice pack. Your refrigerated food and drinks will stay cold longer, and you’ll have nice cold water to drink along the way! You can also fill up plastic bags of ice at restaurants or gas stations to use in a cooler. Grab your free packing checklists here! Thank you! Check your inbox for the link to my free resource page! Download a white noise app to help drown out some of the hotel noises that can wake up sleeping kids. If you are planning to use the hotel's baby crib/cot, travel with your own crib and play yard sheets. They take up very little room in your suitcase. Hotels never have crib sheets. Your sheet will fit more snuggly than what they put on and it's a bit of familiarity for the baby. Consider the closet for baby. Even if Nobody Puts Baby in the Corner, you might want to consider stashing your crib or pack and play for your young one in the closet. It’s dark, cozy, quiet. Obviously, it needs to be big enough to hold the kid, and I recommend leaving the door ajar. Many hotel chains actually now offer a childproofing kit that you can request at check in. If you’re trying to put a curious baby or toddler to sleep, try staggering bedtimes. Have one parent take the older kids out of the room (maybe go to the pool) while you get the youngest to sleep, then text them when the coast is clear to come back in the room. Our toddler thinks it’s playtime if everyone is in the same room as him when he is supposed to be going to bed, so it helps to keep the room really dark and get as many people out as possible. Just make sure the other kids’ pajamas are laid out and ready to go so they don’t wake the baby up looking for something. Our backpack was loaded with fruit snacks, crackers, and applesauce pouches, and cookies for snacking while waiting in lines. Our little cooler bag had bananas, drinkable yogurts, apples, and jam packets so we could make sandwiches with the loaf of bread we had stashed in the bottom of the stroller. We ate breakfast at our hotel each morning before leaving for the park. This helped us save money, but also time because then we weren't waiting in line for food instead of rides. Bring a double stroller! Yes, it is a pain to bring BUT it beats carrying your kiddos! Don't forget stroller fans! One for each kid and one pointed at YOU! Bring a power bank for electronics (cell phone, iPad, laptop, tablet) so if you allow screen time you don't have a meltdown when their show turns off in the middle because power died! Alternate indoor and outdoor rides during your time at Disney World. This way you’ll keep young children from being in the sun for too long and avoid sunburn or heat exhaustion. Disney can get very warm very quickly! When traveling in hot countries with kids who were raised in New England: bring battery powered mini fans! One of the keys we have discovered for a more pleasant experience traveling (whether long distances or short day trips) with young kids is having the perfect travel bags for each child. Read: How To Put Together the Perfect Kids Travel Bags! We bring a camel back on road trips and long city exploration days. We all get sooooo thirsty and it cuts down on trips to buy drinks, money, backpack weight, and trash. My 5yo really loves to be helpful so it's usually his job to carry the water, which he loves! Carry a small crossbody purse that just holds your phone, money, and ID and keep your camera strapped around your body, too! Everything else can go in a backpack under the stroller (or have your significant other carry it). This serves 2 purposes. First, everything is easily and quickly accessible so you can take pictures at a moment’s notice or buy a quick snack or drink without digging through your backpack. Second, if things are strapped around your body they’re a lot harder to steal, which makes you feel more confident as you walk through a new city. MAKE SURE YOU DON’T FORGET A THING! Grab your packing checklist printables from my free resource page from travel-loving families! Sign up for my weekly newsletter to receive the checklists plus more family travel tips straight to your inbox! So there you go! 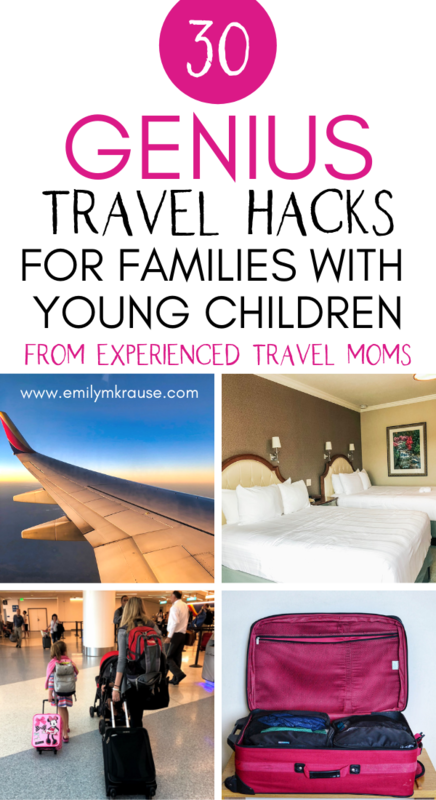 All the top travel hacks for families with young children from moms who have been there, done that, got the t-shirt. If we can all share our collective travel knowledge and wisdom, then each vacation will be more and more enjoyable. Happy travels! Subscribe and get your free packing checklists!